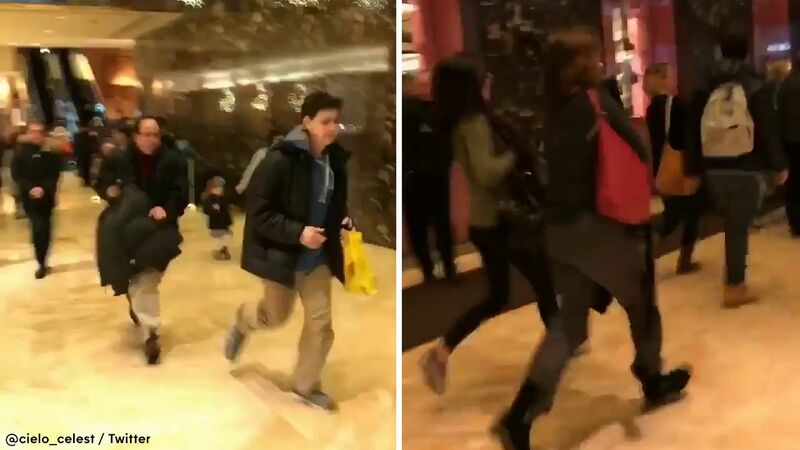 MIDTOWN, Manhattan (WABC) -- A portion of Trump Tower in New York City was evacuated after a suspicious package later deemed to be harmless was found inside the building Tuesday. Just before 5 p.m., the NYPD said a backpack was found in a public space area in the Fifth Avenue building. Officers cleared parts of the building while investigators went in to see what was in the bag. A short time later, the NYPD determined the package was safe, as the bag was filled with children's toys. An "all clear" has been given by officers at the scene. Trump Tower is home to President-elect Donald Trump, who was at his Mar-a-Lago estate in Florida and the time and who will be sworn into office in January. In the meantime, security has been greatly heightened in and around the tower. His newly appointed press secretary, Sean Spicer, Tweeted that officials were "back to work" following the "false alarm." Shoppers and visitors to Trump's namesake skyscraper described a chaotic scramble. "It was hysteria," said Andy Martin, a 16-year-old from Huntington. "Police were shouting and telling people to leave." Trump Tower contains residences, restaurants, retail stores - and a lobby that by law is open to the public to visitors daily from 8 a.m. to 10 p.m.
Police receive about 42 reports every day of so-called suspicious packages, though that number can surge depending on current events. In the days after a pressure cooker bomb exploded earlier this year in New York City, police responded to more than 800 calls of "suspicious packages." Maria Beckford, visiting New York from her native London, was in Niketown with her 13-year-old son looking to buy a pair of soccer cleats when she said they were told to urgently leave the store. "We actually had them in his hands but because of everything we just had to leave," she said.